This is the Crucifixion scene. 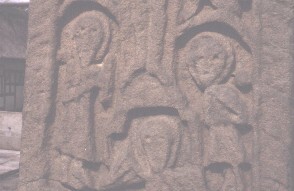 The four evangelist symbols are around the cross, two above and two below. Underneath these symbols there are two other figures, identified as Saints John and Mary, New Testament, John 19:27.